It’s been a while since the last weekly auction watch; certainly not a week… but since then much has happened. Despite the reported downturn in the fortunes of Scotch in general the myriad of whisky auction houses remain immensely buoyant. 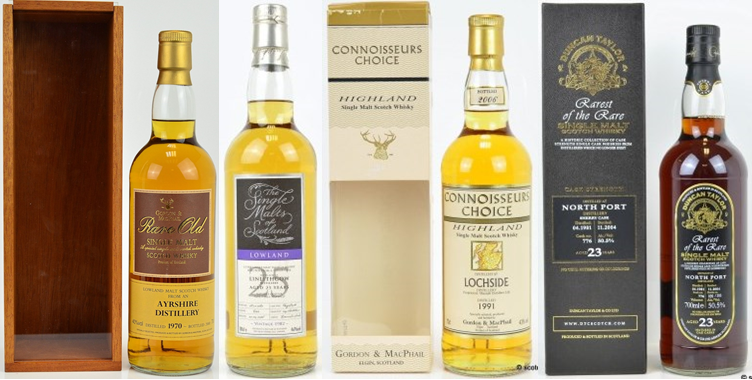 Scotch Whisky Auctions recent sale proved demand is still surging for older rarer bottles of whisky. In an industry that’s still volume driven to a large degree, it’s no small wonder the ‘highly desirables’ keep moving north in value. The tiny remaining numbers of the most sought after bottles are experiencing increasingly intense demand. In a world where we have the first NAS only whisky festival (Lord help us all), never before has age, vintage, quality and rarity mattered so much from a collectors perspective. 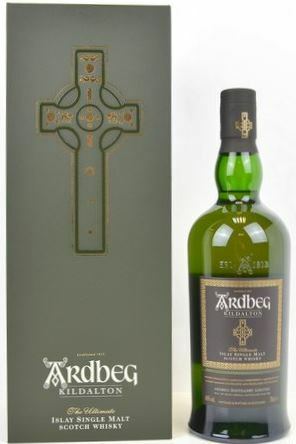 While there were few real Ardbeg rarities, the ones present did exceptionally well. A bottle of the original Kildalton sold for £820, just £20 past its previous best, but a new record none-the-less. Take the flipside of the Kildalton coin and the recent ‘Kildalton Project’ is now trading at £130, some £10 above its original retail price and hugely down from the £250 highs when the first bottles entered the market – Patience is still key when buying: When selling, unless you’re ‘in like Flynn’ with that first bottle, forget it… After sellers commission and VAT £130’s a loss. Collectors favourite Balvenie had a good auction with many prices stable at recent highs. The standout was a bottle of ‘The Cooper’ which sold for £660. I’ve written previously that someone asked if Balvenie could become the new Macallan from a collector’s perspective. In light of Macallan’s current lacklustre auction form could that be crystallising? Compared to Macallan, Balvenie will never have the back catalogue but is seems to have the consistency and quality to win new fans at a rate of knots. There’s always going to be a strong market for Macallan, especially older previous releases and I guess ‘steady-away’ was the tone of this auction. The Robert Burns decanter sneaked a new record by £25 when it sold for £1,800. 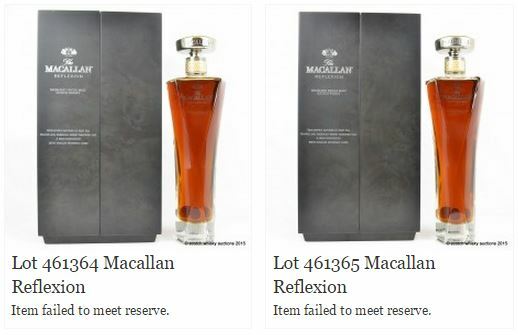 Conversely three out of six NAS Reflexion bottles failed to sell… A kick in the NASticles for high end NAS-Macallan? I reflexted and they’re too expensive. Highland favourite Dalmore has performed well recently and the standout bottle here was Castle Leod. Last month Leod sold for £105 – this month £250 sealed the bidding in what has to be a spike. Expect to see future values back to more mundane/sane levels. 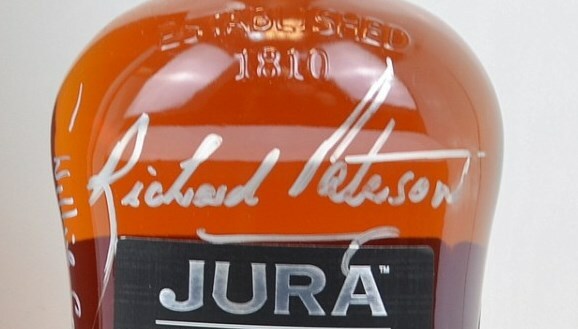 Sticking with Whyte & MacKay, this auction answered an interesting question… Forget his nose but just how much is Richard Paterson’s signature actually worth? Is this signature worth £1m? The popularity of older Laphroaig continued when a bottle of 30 year old sold for a record £840 and a bottle of cask strength 21 year old sold for £560. As with most distilleries, the voluminous releases (many Cairdeas bottles) did nothing of any consequence. The current unleasher of atomic sherry-bombs, Glendronach, performed well. Glendronach prices have been gradually increasing over the past few years rather than seeing massive spikes and corresponding troughs as with some other brands. The old 33 year old hit a new record £430, leaving its 2009 lows of £100 way behind. As has come to be expected (but not taken for granted), bottles from many silent stills achieved new records. The Whisky Exchange’s 1982 25 year old Linlithgow (AKA St Magdalene) sold for £175 exceeding a previous best of £145. A bottle of Connoisseurs Choice 1991/2006 Lochside proved you don’t need to buy something with Richard Paterson’s signature on it to be in with a shout of gaining value. With a 2011 low-point of £33, the most recent £100 sale looks like good progress. Duncan Taylor’s 1981 23 year old North Port sold for £310; way above of its £130 low in 2013. Finally a silent Lowland Lady under the name of Ayrshire on a 1970 vintage (G&M Rare Old bottled 2000) sold for £290, nicely passing its previous best of £250 and strides ahead of its £80 low. The market’s really starting to show what has value and what’s perceived as ‘fur coat and no knickers’… so to speak. NAS dressed up in a crystal vase is always NAS dressed up in a crystal vase…. Other bottles are simply stunning Scotch. Buy the latter!